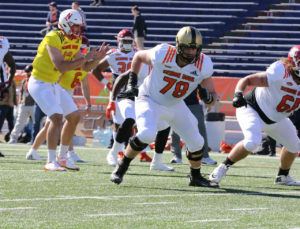 Army offensive lineman Brett Toth improved his NFL Draft stock this postseason after receiving invites to both the 2018 East-West Shrine Game and 2018 Senior Bowl. We talked with Toth about Army's resurgence during his tenure and the transition from an option-based offense in the postseason. Army OT Brett Toth (No. 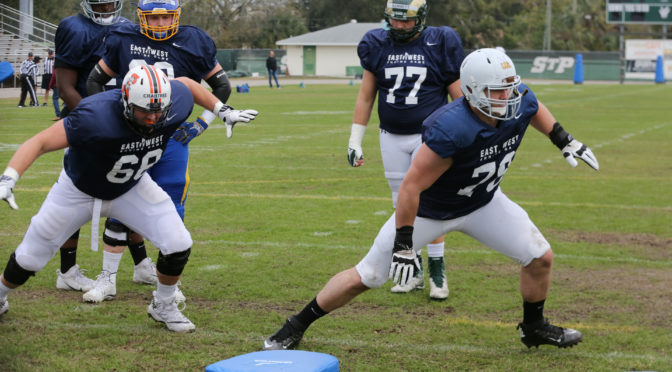 78 pictured) blocking during Day 3 of 2018 Senior Bowl practices in Mobile, Alabama. DN: We’ve had a chance to do a couple of your games the last couple of years. The upset over Temple. DN: Yeah, the first game of the season. Some of your fellow offensive linemen, like Rick Kurz, had to be happy for you (getting selected for the East-West Shrine). 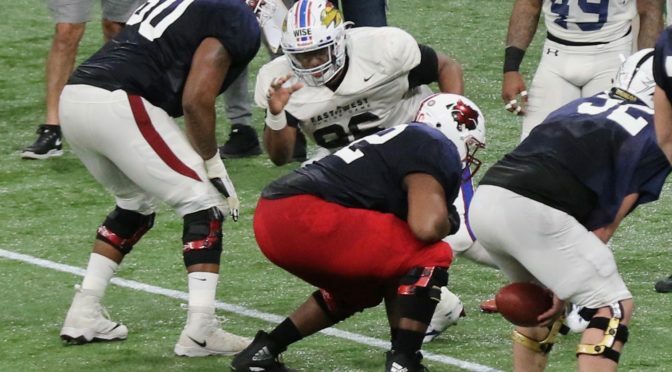 Army has had some defensive backs that have been in some all-star games (Caleb Campbell-2008 East-West Shrine) but you’re one of the more recent offensive lineman. Talk a little bit about being here in the East-West Shrine. 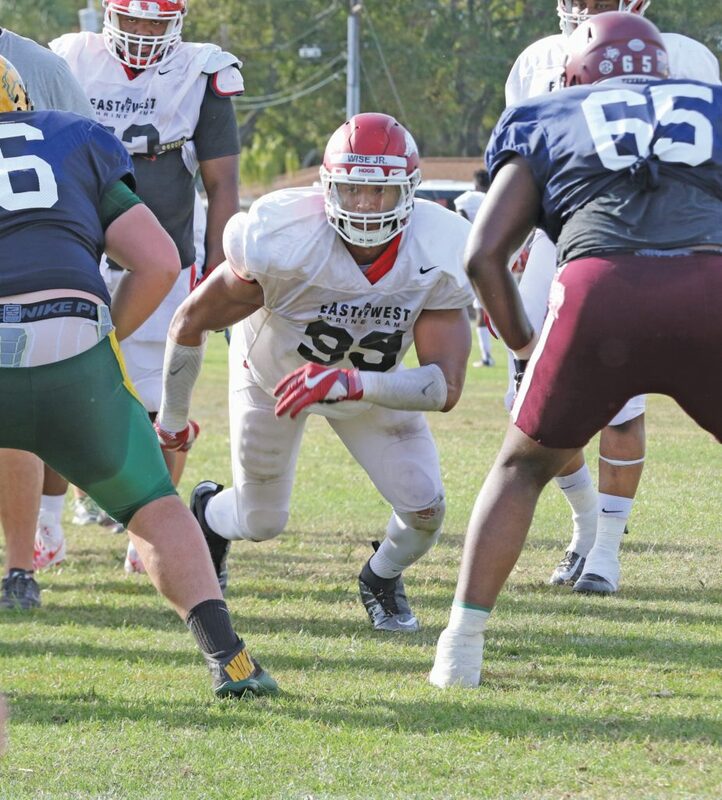 Toth: Definitely I want to say thank you to the Shrine Game. 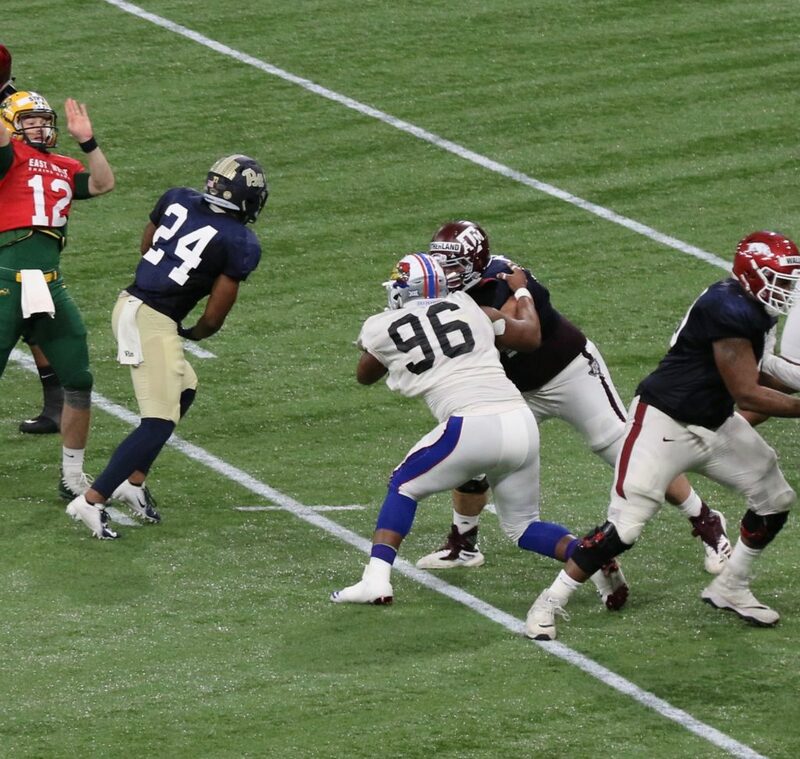 Big statement here at the Shrine Game is that it’s more than just a game. I love that aspect of it, going out and kind of doing community service. The outreach programs -like with Shriners Hospital- it’s amazing, it’s unbelievable. It’s taken the game itself, which is a game we all love, everyone here you gotta love it, being here. It’s taken that and putting the bigger message out there. I’m here representing my school. If we didn’t have the success we’ve had the past two years, who knows if I’d be here. The senior class, the junior class, as you mentioned Rick Kurz. Up front, our offensive line, we were just determined the past two seasons. We were determined to make Army great again. And I’d like to say that we did that following that last win out in Texas (2017 Armed Forces bowl victory over San Diego State). DN: You definitely have made Army great again. Let’s talk a little bit about you. Very versatile in terms of your mobility getting up to the second level. You’ve gained weight while you’ve been in school. At one point, you were starting at around the 270-pound range. What is your weight up to now and how has it felt having to pass set so much out here this week (played in an option-based offense at Army)? Toth: I just weighed in at 305. DN: Wow, that’s pretty awesome man. Toth: Yeah, I was 315 over the break. Got some of my Mom’s home cooking….(laughs). That was nice. Transitioning to the pass set. Again, it’s the raw attributes. It’s the mobility and the kind of stuff that I excelled with. DN: Well, you’ve seemed pretty comfortable so far. Toth: I’ve just gotta tweak a few things. Fundamentals. Watching guys like Zach (Crabtree) over there at right tackle from Oklahoma State. He’s unbelievable with the pass set. So I’m trying to learn as much as possible from him. I feel like I’ve already got the run scheme down out here with the zone, it’s just the pass set is just so much of the game. I need to keep reppin’ it, reppin’ it, reppin’ it and get better with it. DN: We were talking about your mobility and your foot speed, which has always shown up on tape. But it was noticeable when the offensive linemen were racing earlier in practice, that you beat everybody. Do you take that personal, being faster than everybody else (laughs…)? Toth: (Laughs)…Uh, I would actually say it’s pretty close. You get Greg (Senat) from Wagner, he was giving me a run for my money. DN: Best of luck man and congratulations on a great career. Toth: Yes sir, thank you.